There are many different drinking water applications that are appropriate for AdEdge Technologies’ solutions. Small community water providers, both private and public, have found the AdEdge modular or packaged units to be the correct answer to a variety of contaminant issues. Our systems also provide safe drinking water for dairy farms and other agricultural applications. Individual residences use POU (point-of-use) and POE (point-of-entry) systems to ensure the quality of their water. Either small scale remote drinking water plants or large scale municipal drinking water facilities will benefit from DyVaR technology. DyVaR is applicable for one-step treatment of briny liquids to produce the highest quality of drinking water. 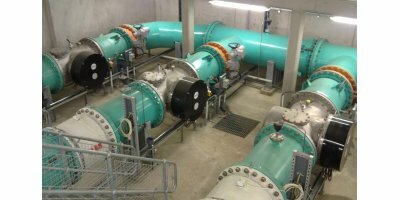 In large scale applications with several treatment steps, DyVaR is well suited to treat IX regenerate streams or the concentration of brines streams originating from conventional water treatment systems. By Salttech based in Sneek, NETHERLANDS. By LIFETECH based in Brno, CZECH REPUBLIC. atg UV Technology is a clear market leader for ground water and surface water UV disinfection. With a large range of independently 3rd party validated UV systems to the US EPA UVDGM (2006) protocols and NWRI Drinking Water and Water Reuse protocols, atg UV Technology can offer both low pressure amalgam and medium pressure UV solutions for flows of 1 m3/hr to over 5,000 m3/hr. For treatment of Iron & Manganese removal, AdEdge Technologies uses our AD26 or ADGS+ media coagulation filtration with ferric chloride as the coagulation agent. This process allows significantly higher flow rates per square feet of media, less backwash water than other conventional approaches, and smaller footprint systems which means lower capital and operating costs. There are no hazardous chemicals or waste involved and the systems may be automated which decreases operator involvement and expense. By MICRODYN-NADIR based in Wiesbaden, GERMANY.